Nationally, home prices rose 6.2% from August 2015 to August 2016. Those prices are predicted to rise another 5.3% by August 2017. 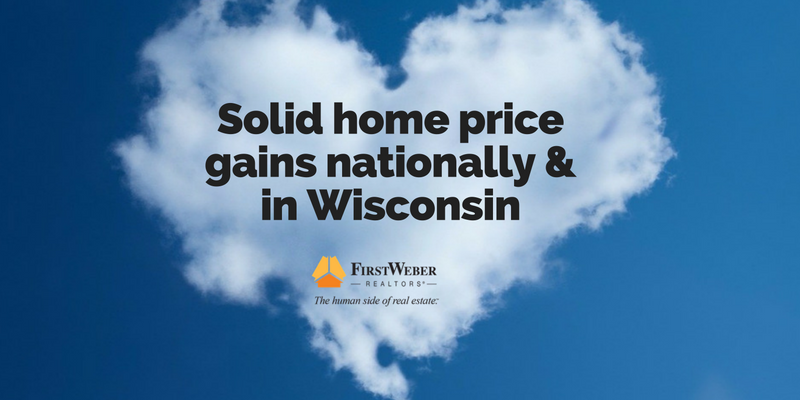 Wisconsin’s home prices rose 5% from August 2015-August 2017. They are predicted to rise another 4.5% by August, 2017. Not surprisingly, the numbers for Wisconsin are slightly less than national numbers. National numbers include volatile states such as Nevada & California where prices can swing up and down quite drastically. We’ll take solid growth over volatile any day. If you have real estate needs in Wisconsin, we are the ones to talk to. With agents in offices all across the state, we can help you buy or sell. Plus, as a member of Leading Real Estate Companies of the World, we can help internationally, too.